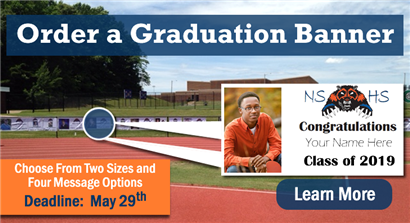 Order a Graduation Banner for Your 2019 Graduate! The next National Honor Society Meeting will take place on Thursday, April 25, 2019, beginning at 2:30 PM in the Library. Attendance is mandatory. Students who cannot attend should see a National Honor Society officer. 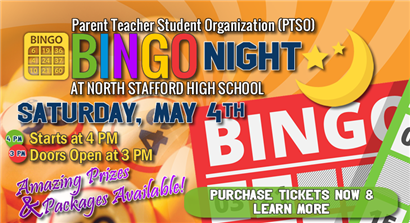 Our Parent Teacher Student Organization (PTSO) will be hosting a BINGO night on Saturday, May 4, 2019, starting at 4:00 PM in our high school's cafeteria. Doors open at 3:00 PM. Win amazing prizes like an Apple Watch, 55" 4K Ultra TV, or a $100 Walmart gift card! There will also be raffle baskets as well as a 50/50 raffle. Proceeds from this event will help to fund student events and activities. Individual BINGO tickets sell for $15.00 and includes a BINGO book, two slices of pizza and a drink. Family BINGO packages are also available for $35.00 and includes four BINGO books, one pizza, and four drinks. Concessions will also be available to purchase additional food and drink items. Some of the prizes are an Xbox gaming system with a 32" TV, spa package, dinner and movie package, family fun night package, Amazing Fire HD 8 with Alexa tablet, dinner packages to local restaurants, and more! To purchase your BINGO packages, raffle tickets, and additional BINGO items, point your Web browser to https://www.ptsobingo.com/s/shop. Download the flyer to see more details and all of the prizes by pointing your Web browser to https://goo.gl/7PEd5x. The North Nerds Tutoring Club is available on Tuesdays and Thursdays after school at 2:30 PM in the Library for students who would like assistance/guidance with homework or class projects. Win a Free Project Prom Experience! Win a free Project Prom experience, valued at $1,500.00! Nina's Boutique is partnering with local businesses to offer our students an opportunity to win an all-inclusive prom experience. A one-page essay must be submitted no later than midnight on Tuesday, April 30, 2019. A parent/guardian consent form must be submitted with the essay. To view the essay components, requirements, and parent/guardian consent form, point your Web browser to https://goo.gl/oaxY6y. Student dues must be paid in order to participate in this contest. Congratulations to Our Boys State Delegate! Congratulations to our Boys State Delegate, Trevor Niles, who will be representing our high school in Virginia Boys State! Trevor is sponsored by the Stafford American Legion Post 290. Virginia Boys State will take place June 16-22, 2019, at Radford University. Due to a decline of student attendance in recent years at After-Prom and rising costs, our high school has made the decision not to have an After-Prom when Prom 2019 concludes this school year. Traditionally, our Parent Teacher Student Organization (PTSO) has organized an After-Prom event. There is an additional student fee that is charged for students who want to attend After-Prom. After-Prom is not included with student dues. It has become cost-prohibitive to fund an after-prom with the amount of students that attend and the costs to rent a facility and/or attractions. The PTSO has been collecting student feedback about After-Prom to find out areas of improvement in future school years. Although After-Prom has been cancelled, students will still have the opportunity to win amazing prizes when attending Prom 2019, taking place on Saturday, June 8, 2019, at 8:00 PM in the Fredericksburg Expo Center. More information about Prom 2019 will be made available soon through our communication channels. Our high school will continue to provide student and family events, especially with the decision to not have After-Prom this school year. Our annual Senior Citizen Student Prom will be held on Saturday, April 27, 2019, from 3:00 PM-6:00 PM at our high school. Senior citizens in our community are invited to attend the prom. This event will feature our North Stafford High School Jazz Band. Door prizes will be given throughout the afternoon. To RSVP to attend this event or if you have any questions, please call (540) 227-4088. Download the flyer by pointing your Web browser to https://goo.gl/a9CTqU. The Stafford County Crime Solvers will be holding a community yard sale on Saturday, May 4, 2019, from 8:00 AM-1:00 PM, at the Stafford County Administration Center, located at 1300 Courthouse Road, Stafford, VA 22554. The event will take place rain or shine. Please include your e-mail address with payment for receipt conformation. *There is a returned check fee of $50.00. For questions, please contact Trudy Taylor at twudy123@yahoo.com or call (540) 903-3971. Download the flyer and yard sale application by pointing your Web browser to https://goo.gl/xfNwDB. Our Cheerleading team will be holding tryouts. A conditioning clinic will be held on Mondays and Wednesdays from April 1, 2019, through May 8, 2019, excluding the week of Spring Break, from 3:00 PM-4:45 PM in the Auxiliary Gymnasium. All athletes must have a VHSL physical. Sideline team tryouts will take place from Tuesday, May 14, 2019, through Friday, May 17, 2019, from 3:30 PM-5:30 PM at our high school. The tryouts on Friday, May 17, 2019, will end at 8:00 PM. A mandatory parent/guardian and cheerleader meeting will be held on Wednesday, May 8, 2019, at 6:30 PM in Room 307. For questions, please e-mail Coach Andi Marra at marraak@staffordschools.net. For more information, view the flyer by pointing your Web browser to https://goo.gl/ydQwMA. Participate in the Fredericksburg Visitor Center Art Contest. 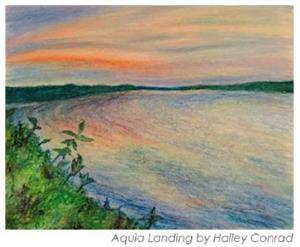 This year’s theme is, “Take the Scenic Route.” Student submitted artwork must be a piece of artwork that reflects a city scene, landscape, or other local scenery in Fredericksburg, Stafford, or Spotsylvania. Twelve pieces of art will be selected to be included in a calendar that will be sold by the Fredericksburg Visitor Center. The deadline for entries is on Monday, May 6, 2019, at 3:00 PM. This contest is only open to North Stafford High School students in grades 9-12. Entry forms are available from our Gifted Coordinator, Mrs. Cardenas, or from our art teachers, Ms. Gallaher and Mrs. Coffman. For more information, download the flyer by pointing your Web browser to https://goo.gl/e4NTp4. Tryout for the Wolverettes Dance Team May 6-8, 2019, from 3:00 PM-5:30 PM in the Commons. Final cuts will be made on May 9th from 6:00 PM-8:00 PM. The Wolverettes dance at half-time during football and basketball season, perform at pep rallies, compete across the state, and represent our school community. There is a mandatory camp that will take place July 11-14, 2019. For questions, contact Corey Holmes at coachcoreyholmes@gmail.com. Download the flyer by pointing your Web browser to https://goo.gl/sFTw9h. We have reported to our school division the Class Websites mobile app issues that users are experiencing when utilizing the StudentVUE/ParentVUE mobile app on their device. These issues are being investigated further. The issues explained below are division-wide and not just isolated to our high school. Users of the StudentVUE/ParentVUE mobile app may experience an error message when selecting the Class Websites button. The user will be unable to view any class websites through the mobile app only. The workaround for this issue is to access your StudentVUE/ParentVUE account from your device’s Web browser rather than the mobile app by pointing your Web browser to https://psp.staffordschools.net. Users of the StudentVUE/ParentVUE mobile app will be unable to view multiple file attachments that are posted by a teacher on the class pages when selecting the Class Websites button for a student’s courses. This issue is present when a user is able to access the Class Websites button from the mobile app (see Reported Issue #1). This issue only appears in the mobile app. Support our high school's Interact Club by turning in Box Tops for Education. All Box Tops for Education will be donated to our high school's connected middle schools and elementary schools. These schools are Rodney Thompson Middle School, A. G. Wright Middle School, Shirley Heim Middle School, H. H. Poole Middle School, Park Ridge Elementary School, Hampton Oaks Elementary School, Winding Creek Elementary School, and Kate Waller Barrett Elementary School. A year-round collection box is located in the Main Office. Please be aware that meeting dates may be changed with notice from our PTSO. If you have any questions or need additional information about our high school's PTSO, please contact Karla Pray, PTSO President, at northstaffordptso@gmail.com. Communication is imperative to the success of our school community. Our community consists of our students, parents/guardians, school employees, and outside community members and partners. We communicate on a regular basis using a North notice. The North notice is the official communication method that our high school utilizes and will always appear in a certain format. It will arrive to the e-mail address that you have registered with us in our student information system. Our high school will also deploy automated phone calls to the phone numbers that you have registered with us in our student information system. Our high school builds a strong connection with our school community and we strive to communicate in an effective, efficient, and timely manner. Learn about how we communicate with our school community. Provisional drivers' licenses will be issued on a walk-in basis Monday through Friday from 2:30 PM-3:30 PM in the main office. No appointments are necessary. If you are not able to make this offered time frame, an appointment must be made by contacting Helene Hall at (540) 658-6150, Ext. 1204. The student must have their driver's permit and the 45-hour driving log. The parent/guardian must have their driver's license. Provisional drivers' licenses will be issued Monday through Thursday from 8:00 AM-3:30 PM in the main office. The student must have their driver's permit and the 45-hour driving log. The parent/guardian must have their driver's license. 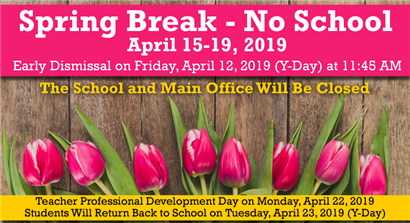 Please call the front office at (540) 658-6150 prior to coming to the school to ensure there is a school official present who is authorized to issue the license. Provisional driver's licenses will not be issued July 2nd-6th. If you need to be issued your provisional driver's license during this week, please come prior to July 2nd or after July 6th. North Stafford High School will graduate lifelong learners who will make valuable contributions to the global community. 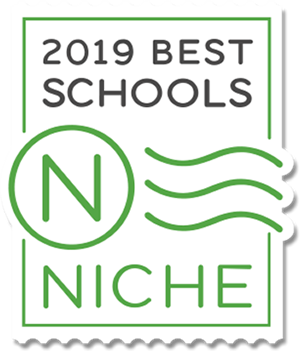 Thank you for ranking us as #102 in the 2019 Best Public High Schools in Virginia according to Niche! We rank in the top 30% of public high schools in Virginia. We are so excited as being one of the best public high schools in not only the Commonwealth of Virginia but our school division, Stafford County Public Schools. In addition to ranking #102 in the 2019 Best Public High Schools in Virginia, we rank #29 in the 2019 Most Diverse Public High Schools in Virginia, #88 in the 2019 Best College Prep Public High Schools in Virginia, and #3 in the 2019 Best Public High Schools in Stafford County! View all of our rankings. 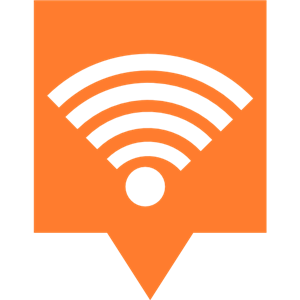 Our building has free, publicly accessible WiFi. 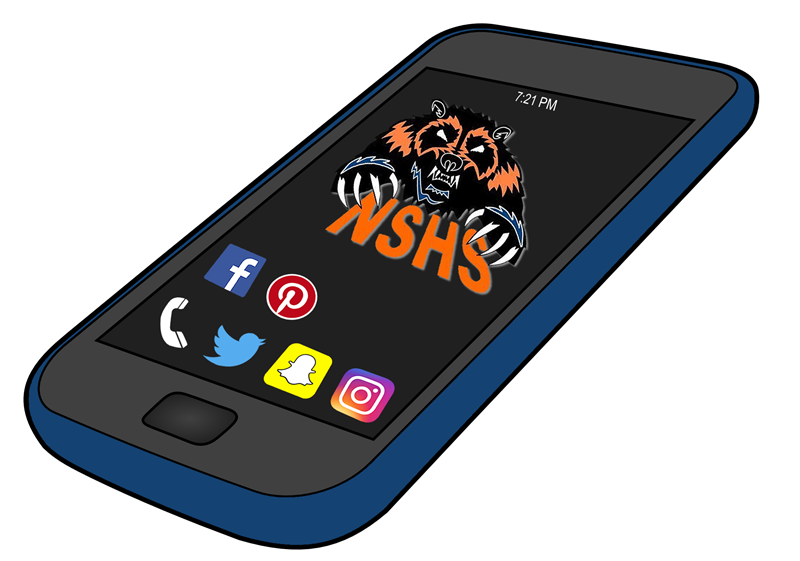 Students at our high school will be able to access their cell phones and devices in the cafeteria (Commons Area), locker area, and hallways during class changes. Students may use their device at their designated lunch time in the cafeteria. In addition, students may also use their device in any area after school, except while attending tutoring. Before a student enters a teacher's classroom, they must silence and put away their device. When classes are in session, students must put away their device, unless directed by a teacher. This includes hallways while classes are going on. This policy also applies to headphones. Your child's classroom Web pages are located on Synergy ParentVUE or StudentVUE, the same application that provides grade and attendance information for your child. To access ParentVUE or StudentVUE, please point your Web browser to https://psp.staffordschools.net. An activation key or having an account setup previously with an activation key is required. Don't have access? Click here to request an activation key (available only to students and/or parents/guardians currently attending or having a child attend North Stafford High School, respectively). At this time, parents/guardians and students do not have the ability to create accounts on our website, Schoolwires.